Geneva, Switzerland – Department of Trade and Industry’s Philippine Trade and Investment Center (PTIC) – Geneva tested the cadmium level of Philippine cacao beans and the results are encouraging! “Davao-sourced fermented cacao beans have low cadmium level that is well within the acceptable values, providing a big opportunity for Filipino cacao farmers,” said Michiel Hendriksz, Executive Director of FarmStrong Foundation. The test was made in light of the European Union’s (EU) new limits on the cadmium levels in cocoa products by 1 January 2019 (EU No 488/2014) that could pose a serious threat to many smallholder cacao farmers, and present a challenge to chocolate producers. “While Switzerland is not part of the EU, it adopts the EU General Food Law and exports majority of its chocolate production to the EU. Swiss consumers also have the highest per capita rate of chocolate consumption worldwide,” according to Mr Jean-Benoit Charrin, Director of Operations of FarmStrong Foundation. Cadmium is a heavy metal found both through natural occurrence and from industrial and agricultural resources. The maximum levels for cadmium in food have existed in EU legislation since 2001. Thus, to reduce exposure levels to the metal in certain food groups where exposure is highest or where the consumer groups were most vulnerable, new recommendations for maximum exposure levels in a range of infant products and cocoa-based products were released. Three maximum levels have been set for chocolate, where the strictest maximum levels apply to chocolate varieties most eaten by children, while a maximum level is also set for cocoa powder destined for direct consumption. Cacao beans from Latin America are particularly affected. Previous research has indicated higher levels of lead and cadmium in cacao beans in Latin America compared to beans from West Africa. Cacao beans from West Africa, however, are considered “bulk beans” and lack the flavour Swiss chocolatiers are looking for. The low cadmium level of Philippine cacao beans brings opportunities for Philippine cacao farmers and producers, particularly in premium products (specialty, fine flavour and certified chocolate) as Swiss chocolate manufacturers look for new sources of cacao beans to protect its international reputation for high quality with many famous international brands. The Department of Trade and Industry, through the various foreign trade posts, supports Philippine cacao farmers in demonstrating significant progress in the Philippine cacao sectors by aiming at niche markets for high quality and speciality cocoa and chocolate products. Government agencies and farmers/producers need to work hand-in-hand to be able to supply high quality Criollo/Trinitario cacao beans with good traceability and superior quality. This positive development is also timely in light of the DTI’s thrust to upgrade the Philippine cacao industry in the global value chain. The cadmium level could also feed in the discussion during the Philippines’ hosting of the Asia-Pacific Cacao Congress scheduled from September 15 to 17 at the SMX Convention Center. To request for a copy of the cadmium test, please write to PTIC-Geneva (geneva@dti.gov.ph). Written by: TSO Magnolia Uy, PTIC-Geneva. 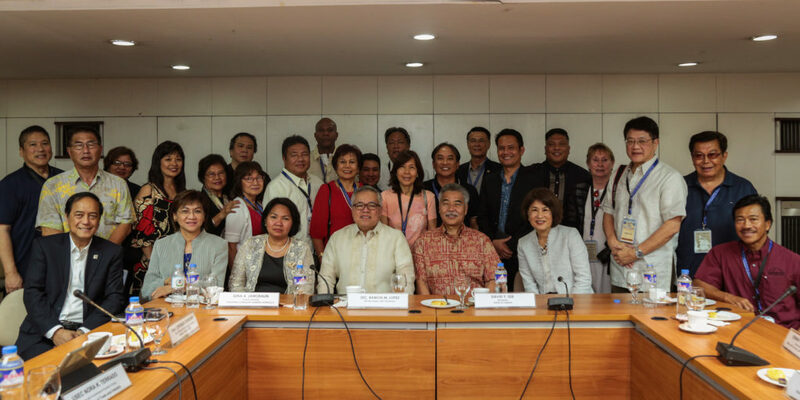 MOSCOW—Following the USD 875 million-worth of potential investments secured between the Philippines (PH) and Russia, Trade Secretary Ramon Lopez endeavored to strengthen PH-Russia business links by engaging, in separate fora, top chambers of commerce in Moscow and St. Petersburg on 25 and 26 May. “I consider business fora in Moscow and St. Petersburg successful because of the good networking and business leads created from both sides,” said Sec. Lopez, adding that participants mostly Russians (70%) in Moscow forum reached about 450, while in St. Petersburg about 200. “These Russian businessmen came from the industries of pharmaceutical, manufacturing, construction materials, iron and steel, property development, power energy, to name a few,” he added. In both fora, the trade chief shared the Dutertenomics strategy for inclusive growth and emphasized PH’s current growth story characterized by strong macro-economic fundamentals, strong investors’ confidence and good governance. Earlier, Sec. Lopez met with the principals and heads of the Business Russia Federation, composed of large-scale entrepreneurs in the area of pharmacy, medicine and mining. They were introduced to potential company partners in the Philippine business delegation. A CEO Roundtable followed involving Russia’s top business executives from Business Russia, R-Pharma (pharmaceutical products, medical research) and Vi Holdings Group(metallurgy, mining and processing, power and energy, real estate). Sec. Lopez sought Russian businessmen’s involvement in developing the country’s infrastructure and public-private partnership (PPP) projects. He also reiterated relevance of adopting an inclusive growth model, integrating micro, small and medium enterprises (MSMEs) in the value chain of bigger companies. Sec. Lopez and PH team showcased various trade and investment opportunities available to Russian businessmen, as well as key industries, wherein PH has comparative advantage. In Moscow on 25 May, Sec. Lopez, Science & Technology Sec. Fortunato dela Peña, Agriculture Sec. Manny Piñol and trade officials exchanged views with the Chamber of Commerce and Industry of the Russian Federation (CCIRF), which represents the interests of small, medium-size, and big enterprises in manufacturing, domestic and foreign trade, agriculture, the finance system, and the services sectors in Russia. Russian Deputy Minister for Economic Development Alexander Tsybulskiy led the Russian delegation with CCIRF President Sergey Katyrin. In St. Petersburg on 26 May, PH team held a business forum with St. Petersburg Chamber of Commerce and Industry, the largest chamber of commerce in the Russian Federation. St. Petersburg is home to many economic clusters and is also known as an industrial, cultural, logistical and pharmaceutical center. St. Petersburg Forum attendees also conducted networking with their counterparts, with St. Petersburg businessmen presenting their priority industries with focus on the pharmaceutical cluster. On 26 May, PH delegation also met St. Petersburg’s Chairman of the Committee for External Relations Evgeny Grigoriev, who immediately expressed intent to help in the field of cheaper medicine and pharmaceuticals industry, and healthcare solutions. “They are also advanced in marine and naval engineering, and offer training and apprenticeship to Filipinos, as well as in education scholarships in life science and research institutions which St. Petersburg is known for,” said Sec. Lopez. The trade chief also confirmed that PH will also do industrial cooperation agreements to promote common interests in iron and steel, machineries, pharmaceuticals, agribusiness, shipbuilding and ship repair, automotive, aerospace as well as in culture, arts and many more. “The focus really is on the pharmaceutical cluster, which is one of the biggest industries in St. Petersburg and can be a strategic avenue to cooperate with the Philippines, specifically in support of the President’s health program,” he said. PH-Russia bilateral economic relations is in nascent stage, according to him. There is concrete intention to thoroughly explore the opportunities and potentials that arise from the capabilities and strengths of each other’s industries. “This is just the beginning of our deep and strong partnership with Russia. They await with excitement the return of President Duterte to Russia and they will certainly extend more fields of cooperation, building on what we have started,” he concluded. MYANMAR—Following developments on the presidential visit to Myanmar, the recent meeting (20 March) among Myanmar President U Htin Kyaw, State Counsellor and Foreign Minister Daw Aung San Suu Kyi and President Rodrigo Duterte resulted to a substantial discussion on concrete ways to strengthen bilateral economic relations between the two countries, specifically on areas of trade and investment, agro-industry, food security and micro, small and medium enterprises (MSMEs). “The meeting between President Duterte and Myanmar’s top leaders touched on mutually-beneficial strategies to increase trade and investment, to develop MSMEs and to provide agri-technical assistance,” said Department of Trade and Industry (DTI) Secretary Ramon Lopez, who was part of the Philippine delegation, alongside Agriculture Secretary Emmanuel Piñol, Acting Foreign Affairs Secretary Enrique Manalo, Senators Alan Peter Cayetano and Vicente Sotto III and other Philippine government officials. Both countries expressed interest in furthering agricultural technology, which includes capacity-building measures, education cooperation and exchange of best practices through agricultural specialists and experts. Specifically, the meeting explored approaches to advance efficient production of hybrid rice and piña fiber clothing. “By and large, there was heightened interest to increase investment in Philippine agriculture and food processing. All these initiatives will be under a Joint Commission on Bilateral Cooperation,” Sec. Lopez added. Meanwhile, a Memorandum of Understanding (MOU) on food security and agricultural cooperation between the Philippines and Myanmar was signed between the Philippines and Myanmar. Said MOU aims at making food accessible and affordable, including through promotion of joint development ventures, conduct of research and development (R&D) transfer or technology transfer, sourcing of raw materials for value adding and conduct of training and capacity-building both in technological and managerial levels. The MOU likewise indicates that Myanmar is welcome to study Philippine agriculture, according to the trade chief. “Of course, as chair of ASEAN, the Philippines consistently sought Myanmar’s support for the region’s deliverables this year, touching on increasing trade and investment, integrating MSMEs into the global value chain and promoting an innovation-driven economy,” he concluded. Investments among the 10 member States of the Association of Southeast Asian Nations (ASEAN) is expected to significantly increase, and linkage among ASEAN micro, small, and medium enterprises (MSMEs) with ASEAN and global multinational enterprises (MNEs) to further strengthen, as the regional bloc’s Coordinating Committee on Investments (CCI) in its 69th Meeting in Manila recently agreed to push the Focused and Strategic Action (FAST) Action Agenda on Investment as among the Committee’s priority deliverables for the year. Aligned with the four pillars of the ASEAN Comprehensive Investment Agreement (ACIA) namely investment promotion, facilitation, protection, and liberalization, the FAST Action Agenda is composed of four key deliverables. The CCI is ASEAN’s technical body tasked to oversee the implementation of the ACIA since its effectivity in 2012. ACIA serves as the regional bloc’s instrument in support of the ASEAN Economic Community’s goal of free flow of investments in the context of an integrated ASEAN community. The Philippine Board of Investments (BOI), being the country’s lead for CCI, serves as host for the 69th CCI Meeting. The first action agenda is focused on ASEAN-wide assessment of the outstanding issues on Trade Related Investment Measures (TRIMS) where the key deliverable for the year is a document identifying the TRIMS plus elements that ASEAN may commit and adopt as a common ASEAN’s negotiating strategy. The second action agenda is focused on linking MSMEs with MNEs where the key outcome are possible letter of intents (LOIs) and business collaboration between ASEAN MSMEs and MNEs. For this year, the Philippine will host the outbound mission from ASEAN where a conference and business meetings will be undertaken. “Our goal is to showcase MSMEs as possible suppliers of products and services to MNEs. As we encourage them to strategically enhance their productivity, we will open up more opportunities for them to participate in the regional and global value chains,” said BOI Executive Director Ma. Corazon Halili-Dichosa, who also served as the Philippine Head of Delegation to the CCI. During the meeting, it was discussed that Philippines will host a conference where MSMEs and MNEs from all over the region will participate which includes business matching, wherein possible linkages and agreements may be forged. As part of the preparation for the event, ASEAN Members States (AMS), have agreed in the 69th CCI Meeting to identify possible MNE participants to facilitate the identification of focused sectors and MSMEs who will participate in the business matching activity. MSMEs are considered one the key drivers of economic growth across many regions of the global economy, including ASEAN. These firms account for 95 to 99 percent of all business establishments and are responsible for 51 to 97 percent of employment among AMS. In terms of GDP share, MSMEs account between 23 to 58 percent of any AMS economy. With the significant contribution of these firms on income and employment generation, CCI considers MSMEs as the backbone of the ASEAN economy. The third action agenda is focused on the assessment on the establishment of an ASEAN Investment Tribunal.CCI has recognized the need to do the said assessment given the numerous investment agreements that ASEAN had entered into and the need to have consistency and predictability in the interpretation of ASEAN investment agreements. Finally, the fourth action agenda is focused on an in-depth assessment of the business registration requirements among ASEAN in support of the investment facilitation goal of ACIA. “Ease of doing business through facilitation of business registration in any AMS will significantly contribute in making the region a more attractive investment destination. An in-depth assessment of the business registration requirements of AMS will support and contribute to ACIA’s key objectives of increasing intra-ASEAN investments,” said Executive Director Dichosa. Intra-ASEAN investments continue to significantly contribute to the investment inflows in ASEAN. In 2015, intra-ASEAN investments’ share to total investment inflows rose to 18.5% from 17% in 2014. Intra-ASEAN investment reached US$22.2 billion in 2015. The Department of Trade and Industry’s Consumer Protection Group (DTI-CPG) joins other member organizations of the Consumers International (CI) from different countries in the celebration of the World Consumer Rights Day (WCRD) on 15 March 2017. The Consumer Protection and Advocacy Bureau (CPAB), under the DTI-CPG, in coordination with the Consumers International (CI), holds a half-day Consumer Forum on 15 March, from 1:00PM to 5:00PM at the Robinsons Galleria Activity Area in commemoration of the WCRD. The WCRD is an annual occasion which marks the day when the late US President John F. Kennedy formally addressed the issue of consumer rights on 15 March 1962 at the US Congress. It provides an opportunity to raise global awareness about consumer rights which must be protected and respected at all times. better digital access, security, understanding and redress. The forum topics include E-Commerce Business Ethics and Trends in Online Shopping, Tips to Avoid Online Shopping Fraud and Scam and Promotion and Development of E-Commerce in the Philippines. The keynote message will be delivered by DTI-CPG Undersecretary Atty. Teodoro C. Pascua, while the forum speakers are Director Mark Joseph Panganiban of the Digital Commerce Association of the Philippines (DCOM), Inc.; Supervising Agent Martini Cruz of the National Bureau of Investigation (NBI), and Division Chief Maria Crispina S. Reodica of the DTI-E-Commerce Office. The DTI-CPAB has invited participants from micro, small and medium enterprises (MSMEs), consumers, academe, youth, DTI employees, LGU and other government agencies to attend the event. Undersecretary Pascua asserts, “Through the Forum, the Department aims to create and promote a reliable digital economy that consumers can depend on without having to worry about their safety and security”. “Aside from prioritizing the rights of the consumers, the DTI-CPG particularly identifies the Filipino students, as millennials, to actively participate in the advocacy program for consumers to understand their rights and to exercise them”, Undersecretary Pascua adds. The Department intends to educate students on their privileges as consumers knowing that they are more likely to engage in many online transactions and be involved in e-commerce activities. For the forum, the DTI-CPAB invited the contest winners of the “Tanghalang Pangmamimili” that was conducted by the DTI’s Regional Office of CALABARZON (Region-IVA) to show their winning performances. The Tanghalang Pangmamimili is a competition among CALABARZON students that happens every October in celebration of the Consumer Welfare Month. It is a stage play wherein students perform situations that consumers face concerning their rights and responsibilities. In line with this, the DTI-CPAB will formally launch its “Dulaang Mamimili”, a nationwide contest in order to influence the youth, especially students, to become more aware of their rights and responsibilities and use them. For more information on the WCRD celebration, call DTI Direct 751.3330 or send an email message to cpab@dti.gov.ph or cpg@dti.gov.ph.